Affiliate Marketing is a way to make money online by referring potential buyers to someone’s site to purchase their products or service. When the sale is made, we (the referrer) make a commission, a percentage of the total sale made. In theory it sounds very easy. 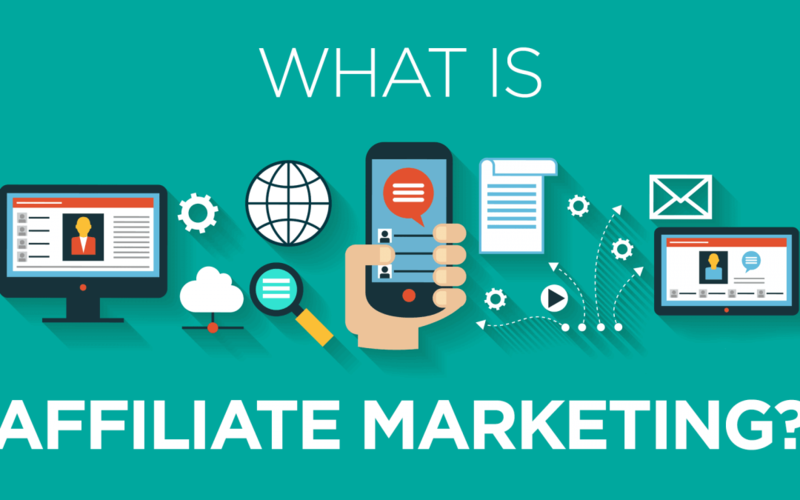 At the simplest level that is what affiliate marketing is. As with most things, this is just the tip of the ice-berg. This way of making money online is very attractive for a view different reasons. 1. You don’t have to create any product, or offer a service. Most of us want to get started online as an affiliate because it is so easy to start. There is virtually no start-up costs. You will need a website, and hosting. Compared to starting any other business this is very affordable for most people. Costing roughly $5-$11 a month for hosting a domain, and about $10 a year for the purchase of that domain. The beauty of affiliate marketing is that you don’t have to create a product, or offer a service. Someone else has gone through the whole process of determining what a particular market or niche needs and developed a solution in the form of an information product that can easily be downloaded. It may even be a physical product that gets delivered to the person. You will find that most affiliate marketers are marketing information products. This is because they can be delivered to the one buying it immediately, satisfying the cultures “I want it, and I want it now!” attitude. Information products are extremely popular because they cost significantly less time and resources to produce, compared to a physical product. I have worked in customer service for over 5 years, and trust me it is something I do not want to do in my free time. I can think of a million things I’d rather be doing. By not being the one selling the product you are also not the one dealing with the complaints, or refund requests if there are any. Even the best product will still have to deal with its fair share of questions, complaints, or refunds. Not having to be involved in this part of the business allows you to focus on more important things. Like getting the right kind of traffic to your site, to then refer them to the sales page for your affiliate product. The more targeted traffic the more money you can make. 3. You can start to be an affiliate very easily in just about any market or niche you want. Starting off as an affiliate can be done very quickly and the sky is the limit on what you can promote. Next time you are at a site take a look all the way in the bottom of the page. In the footer section, and you will most of the time see a link that says either “Affiliate” or “Affiliate Program” or “Referral Program”. You can simply click the link and review through their particular program and determine if the commission pays well, and if they have a good support system, providing different types of marketing banners, links, even articles and product information that will be useful for you to use when promoting their product or service. There are also affiliate networks you can join and have access to hundreds or even thousands of different products that are one-click away from you being an affiliate for. The most common and easy to get started with affiliate marketing is with ClickBank. They provide all the backend support between you (the affiliate) and the product vendor. This makes it very easy for both to do business together. They have tens of thousands of products you can promote with up to 75% commissions. Not only this but they also do all the tracking and have detailed reporting so you know exactly how effective your marketing is. This all sounds great, and it is. But there are some things to consider before getting started with your online business as an affiliate. 1. This is not a get-rich quick method. The internet is flooded with “Internet Gurus” claiming they have the next way for you to quit your job and make millions while drinking champagne on your yacht. They are for the most part full of it, and make money online by selling false hope to gullible prey, and I say prey because it is as if the new-comers are taken advantage of by being sold products that cost hundreds or thousands of dollars and produce no real valuable content. I am here to show you what works, and what doesn’t. And what to expect with the ways of making money online I discuss. Affiliate marketing will make you money, but it will not happen overnight, and you will have to work at it. Do not expect to be rich with one site. 2. It takes time to build traffic. Unless you plan to pay for traffic you may not even see any traffic coming to your site for weeks, or months, sometimes you may feel like giving up because you aren’t seeing the traffic you expected. It is about persistence and staying focused. I will talk more about that in a later post. For now, know that if you plan on getting organic search engine traffic it will take time. 3. Pick the right niche/market. The most common delay in getting started, and biggest reason people give up is because from the beginning their chosen market/niche was never any good. One reason is there was not enough people in the market to sell to. Making it a poor way of making any real money online. Another reason ideas fail is because you pick a niche that your audience are not willing to pay for a solution. The internet is full of free information and getting someone to pay for something that is readily available for free can be a waste of your time. For example, I wouldn’t suggest getting involved in a recipe site, or referring someone to a place to get premium paid for cooking tips or recipes. Simply because there are so many free sites out there, providing high quality information for no cost. 4. The sales page for the product needs to convert. When you start to send your traffic to the vendors sales page is when you make the sale, or you miss the sale and they close the browser or go somewhere else and not buy anything. Before you blindly get involved with marketing a product or service be sure to review the site you send you visitors too. It is extremely important that this page is a high quality sales page. Nothing will be more frustrating for you as an affiliate marketer than getting qualified traffic to an ineffective sales page resulting in missed commissions. I briefly went over the pros and cons to Affiliate Marketing and there is plenty more discuss. I will go into each facet of How to Make Money Online as an Affiliate in more detail in future posts so please subscribe email newsletter and check back frequently. I am sure you have plenty of questions so please post any comments below.